What a bargain this compilation is! EMI are offering this generously-filled, two-disc set for the price of a single CD and it includes the first appearance on CD, seventeen years after its release on LP in 1982, of Haitinks thought-provoking recording of Waltons First Symphony; the original issue of this recording even reproduced a note of thanks from the composer himself on the back of the sleeve. There have been many exciting versions of the First Symphony, but Simon Rattles 1990 EMI recording (CDC 556 5922) has set such high standards of orchestral precision that no previous recording can now emerge unscathed from detailed comparison with it: even Bryden Thomsons high-voltage recording (made earlier in the same year for Chandos with the London Philharmonic Orchestra) betrays inadequate attention to orchestral balance next to the care over detail shown in Rattles version, the latter now a clear first choice if you want only one recording of this masterpiece in your collection. The significance of Haitinks version is that it sheds new light on the symphony, rendering comparisons with other recordings irrelevant. Even if you have the Rattle version, Haitinks is so innovative that it is worth investing in for the new insights it will give you into the work. EMI have served this symphony well over the years, ever since recording Waltons own interpretation with the Philharmonia in 1951 (it is to be hoped that eventually they will reissue their compelling 1988 recording by Vernon Handley and the Bournemouth Symphony Orchestra, vastly superior to Handleys previous version, now on ASV) but they struck gold when they engaged Haitink to commit his adventurous view of the work to disc. His concentration ensures that his performance of the first movement is commanding whilst avoiding the cliche of reducing it to a series of climaxes: his reading has a dark, threatening character even in the passages where some conductors allow the music to relax. There is an implacable sense of momentum, achieved by the combination of a slow tempo and the massive weight of sound produced by the Philharmonia: listen to the breadth of sonority which the brass achieve at 1451 with only bassoons to support them. The ending of the movement is intimidating in its force, suggesting a triumph of vengeance. The presto may be less superficially exciting than Previns famous RCA recording, but Haitinks steadier tempo allows us to hear details of the orchestration more clearly. The extremely-slow account of the andante is sustained magnificently, a few ignored dynamic markings in the score an insignificant price to pay when their exclusion enables Haitink to present such a personalised performance, with every note carrying emotional weight. The tension in the finale is graded carefully, judiciously understated at some points so that the final climax at 1235 is of shattering impact. The (relatively-early) digital recording is of demonstration quality, even by todays standards, the heavy bass lines of Waltons orchestration heard with striking definition, with a resonant ambience conveying a sense of space without compromising clarity: a superb piece of sound engineering by Christopher Parker at Abbey Road Studios. Previns accounts of the two overtures and the Second Symphony originally appeared together on LP in 1974, coupled with Constant Lamberts Rio Grande. These recordings of the overtures are the same ones as those already available on CD, coupled with Previns performance of Belshazzars Feast. These boisterous performances still sound well. The recording of the Second Symphony has been deleted for years (it was once available on CD coupled with Malcolm Sargents worthy but now surpassed recording of the First Symphony) and was only the second version of the work to be released, its predecessor being George Szells very fine LP for CBS, issued in 1962. Previns account has not been equalled since. His performance captures the volatile nature of this rewarding score, which can erupt into violence then return to sensitive textures within a few seconds. Previn does not shy away from the underlying fierceness of much of the music: this is a dynamic performance with a welcome abrasive edge to the sonority where required. Nevertheless, the most memorable achievement of this recording is the beauty of sound which Previn creates with Waltons scoring: the addition of two harps, piano, celeste, glockenspiel, xylophone and vibraphone to orchestral resources which (even without these instruments) are already larger than the First Symphony, is demonstrated here to be far more than an experiment in novel timbre, because Previn blends their tonal colours into the texture with such refinement that even the most sceptical listener will be persuaded that the essential substance of the music demands their inclusion. Previn and the LSO present here a strong case for regarding the central lento assai as one of the greatest slow movements in British music. Torteliers 1973 recording of the Cello Concerto was originally coupled on LP with Shostakovichs First Cello Concerto, whilst Haendels 1977 version of the Violin Concerto appeared on LP with Brittens Violin Concerto and is already available on CD with the same coupling. Torteliers individual style of playing is always instantly recognisable and it is a pleasure to hear him tackling Waltons idiom with such flair; Haendels performance may have less individuality than Menuhins 1969 EMI recording with the composer conducting, but she is more comfortably in control of the alarming technical stunts which Walton crammed into the score, especially in the presto capriccioso, to please its dedicatee, Jascha Heifetz. Both of these fine performances add to the attractions of this set, but for me, it is primarily the long-awaited return to the catalogue of Haitinks revelatory account of the First Symphony and Previns classic account of the Second Symphony which makes this release from EMI such an important event. The curiosity of this double CD album is Haitink's account of the Symphony No 1. The Gramophone hailed it as 'a revolutionary reading that no Waltonian should miss'. The orchestral playing is very good, although the balance and other recording features are occasionally suspect, the performance is a very personal one. There is no doubt that Haitink is one of our finest musicians and conductors, a highly gifted man and one of genuine sincerity and integrity. His Mozart recordings are superlative and I remember his stirring account of Shostakovitch's Symphony No 10 which he conducted at the Proms a few years ago. In a more recent Proms concert Rostropovitch conducted the same work and added ten minutes to its length and, quite frankly, it was tedious. But now, the boot is on the other foot. Haitink takes 51 minutes on the Walton whereas, for example, Bryden Thomson on Chandos takes 44' 42" and, to my mind, his is the finest account of the work with Vernon Handley coming in second. The first movement of Haitink's reading is too slow, particularly in the section figure 19 to 24 in the score, the passage which begins with a bassoon solo. It drags. The jagged string writing is not realised by Haitink until the final pages and therefore the music's agitation is lost. The reduced speed puts a strain on the oboist's famous tune but suits the strings when they have it (figure 18). Sometimes the brass is too heavy and obscures other orchestral detail. Just before the end the tuba part is somewhat crude being too prominent and having the gait of plodding obesity. In this performance both the continuity and the momentum are regularly lost. In addition, the music becomes solid and mechanised and occasionally hints at Elgarian nobilementes and, despite Lady Susanna Walton's rejoinder and the claims of Michael Kennedy, Sir William hated the suggestion that he was Elgar's successor. And, at the risk of the cudgels being taken up against me again, Walton did not like Elgar's music. The second movement Presto con malzia is only slightly slower than most performances. Haitink brilliantly avoids the pitfall of observing the 3/4 time signature and plays it as one in the bar. The first timpani entry is murky and lacks clarity. The section of repose (figure 52 ff.) needs a greater 'drawing out' of detail to maintain interest. In the noisy sections the brass overwhelms other detail. However, the horn trills are very exciting. But, what is worrying is the brass interruptions in this movement which are exaggerated so that they sound like accidents, as if someone has dropped a load of old iron, making these entries mere caricatures. And the conclusion of the movement is crude rather than convincing. The slow movement is, at times, bordering on the tortuous. Haitink is three minutes longer than Thomson. The opening flute observes unwritten, and therefore unauthorised, rests (bar 8) as does the clarinet (bar 26). In addition, both cut their minims not giving them the full two beats. The timpani at figure 89 is certainly not pppp as stated in the score. There is a moment of gloriously-captured sinisterism just before figure 92 and some exquisite string playing follows. But this movement is on two halves, the second being maestoso and declamatory and is full of exaggerated and somewhat empty gestures and this performance confirms that. Thomson's better-judged tempi does not show the music to such a disadvantage. Along with others, I do not think the finale works. In this performance the opening maestoso is rather feeble and the brioso section lacks drive and an unveiling of the inherent rhythmic interest. At figure 112, the fugato takes the music into the realm of predictability and at 117 the performance breaks down and yet Walton does not indicate a slackening of the tempo. The vivacissimo section simply isn't. There is no real life or bounce and, as a result, the music often sounds banal or like a series of jingles. The same problems of the previous movements exist and, while accepting that this is a very difficult movement to pull off, Haitink's laboured performance simply does not work. At figure 139 the strings are marked ff molto marcato but they are not. The splendid conclusion is lacking in sparkle. Haitink simply does not understand Walton or this incredible score. But he is not the only miscreant. Rattle's performance is even worse and, quite frankly, a shocking misrepresentation of Walton's genius. For those who like musical mysteries, you might like to compare some of the themes of the Walton with those in Constant Lambert's Rio Grande and draw your own conclusions. The next item, the Cello Concerto of 1956, as also the Symphony No 2, shows the influence of Walton's only teacher, Humphrey Searle. Now this influence was not in serialism but in a clarity and economy of style. It is extraordinary that both books on Walton by Michael Kennedy and the composer's widow both omit that vital fact of Walton's extensive studies with Searle. Walton went to Searle for about two years after the Second World War. Both the Cello Concerto and Symphony No 2 are translucent and far better structured than the Symphony No 1. The former overwhelming and exhausting power is now replaced by a lack of recklessness and enviable control. The Cello Concerto is a gem, an extremely good piece. When I consider the adulation given to the Elgar and compare it with this masterpiece I am lost for words. 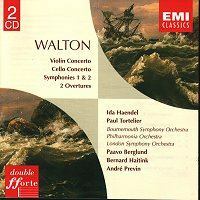 Bax, Bliss and Finzi wrote fine Cello Concertos but the Walton is probably the greatest. In this performance, Paul Tortelier's tone is quite ravishing and Paavo Berglund understands the score. The new-found-Walton-clarity serves this piece well and it is a beautiful reading and no more needs to be said. The Violin Concerto of 1939 has one of those unforgettable and haunting melodies and Ida Haendelis the exemplary soloist. It is lovely, warm, soul-satisfying music and, again, both soloist and the excellent Paavo Berglund give convincing performances. The fast section in the opening allegro tranquillo is a marvellous tour de force and throughout the Berglund performance the orchestral balance and detail is perfection and the sheer exuberance and excitement missing from Haitink's performance is here. This is how Walton is to be played. The Neapolitan presto is played with real effervescence and the final vivace has a verve about it. It is such a pity that composers introduce long slow sections in quick movements ... Elgar did it in both his concertos ... and Walton does it here. In his case, however, the music is of such quality that it works and what a splendid tone Ida Haendelhas. The Symphony No 2 was premiered at the Edinburgh Festival in 1960 and received hostile criticism. It is a better work than the Symphony No 1 largely because of its exceptional clarity and it is much more original. Fortunately, it lacks the overwhelming power of the earlier work and yet it has a power and conviction all of its own. It has a maturity and a tension that evolves naturally from the thematic content and André Previn is a fine advocate of this rather special work. The same conductor gives us two overtures, Portsmouth Point and Scapino in performances of gusto but I wonder if these pieces are of any great purport. They are colourful and enjoyable pieces but are not profound. The recordings on this double CD date from 1972 to 1981 and were digitally remastered in 1999 for this compilation. Sympnony No 1 was an original DDD recording. I heartily recommend the performances except the Symphony No 1 which is a failure.